boost your energy and restore your body to its peak performance. 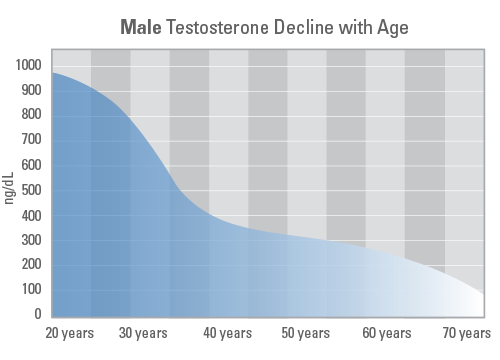 It seems like aging is an inevitable decline in strength, performance, sexuality and energy for men. However, getting older and feeling your very best don’t have to be opposing forces. Declining hormone levels, a phenomenon often synonymous with aging, is largely to blame for the unwelcome “effects of aging” so many men experience later in life. Weight gain, muscle loss, fatigue, insomnia and erectile dysfunction are just a few of the classic symptoms of hormone imbalance in men. But there’s good news– it’s treatable. Hormone replacement therapy is a rapidly emerging field of medicine that is redefining aging in men. For men, getting older no longer means the end of a high-quality, virile life. Male aging begins much earlier than most men realize. Testosterone levels start to drop at a slow and steady rate in a man’s late twenties and continues well into his golden years. This decline becomes more evident in middle-age when some men experience what has become known as andropause, or “male menopause.” This condition of hormone imbalance in men is characterized by a number of distressing symptoms, such as fatigue, muscle loss, increased body fat, sleeplessness, night sweats, irritability, depression and various forms of sexual dysfunction, like low libido and erectile dysfunction. Low testosterone affects more than a man’s quality of life, it can seriously diminish his health too. Men with Low-T, as the condition of low testosterone is commonly referred to, increases a man’s risk of osteoporosis, diabetes and diminishes his mortality rate as well. Research has shown that maintaining balanced testosterone levels throughout the lifespan improves quality of life and raises the life expectancy for men. Another hormone that impacts a man’s health and quality of life is human growth hormone (HGH). HGH plays significant roles in bone strength and density, muscle growth and mass and even brain function. This hormone peaks late in adolescence and starts to decline in a man’s twenties. By the age of 60, most men have little to no production of this vital hormone. Men don’t have to live with low testosterone or diminishing HGH, nor does any man need to continue suffering from the frustrating symptoms that accompany these forms of male hormonal imbalance. Hormone replacement therapy and lifestyle changes can safely and effectively reduce the outcomes commonly associated with aging in men. The benefits of a comprehensive treatment plan for hormone balance in men, extends well beyond addressing symptoms. At the biostation, we strive to deliver medically-based solutions to low testosterone and other conditions of aging affecting men in South Florida. 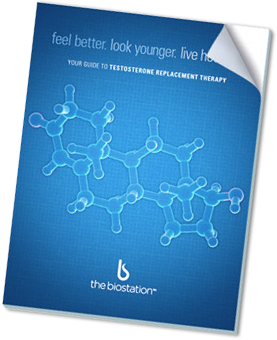 Bioidentical testosterone therapy is powerful, proven and safe. e-book to learn if it’s right for you.